An Sardina pilchardus in uska species han Actinopterygii nga syahan ginhulagway ni Johann Julius Walbaum hadton 1792. 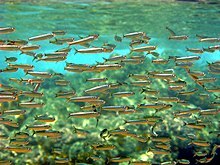 An Sardina pilchardus in nahilalakip ha genus nga Sardina, ngan familia nga Clupeidae. Waray hini subspecies nga nakalista. ↑ 1.0 1.1 1.2 1.3 1.4 1.5 1.6 1.7 Whitehead, P.J.P. (1985) FAO Species Catalogue. Vol. 7. Clupeoid fishes of the world (suborder Clupeioidei). An annotated and illustrated catalogue of the herrings, sardines, pilchards, sprats, shads, anchovies and wolf-herrings., Part 1-Chirocentridae, Clupeidae and Pristigasteridae. FAO Fish. Synop. 125(7/1):1-303. ↑ 2.0 2.1 Whitehead, P.J.P. (1990) Clupeidae., p. 208-227. In J.C. Quero, J.C. Hureau, C. Karrer, A. Post and L. Saldanha (eds.) Check-list of the fishes of the eastern tropical Atlantic (CLOFETA). JNICT, Lisbon; SEI, Paris; and UNESCO, Paris. Vol. 1. Ini nga pakli kataposan nga ginliwat dida han 14:23, 20 Hulyo 2013.